Home » Blog » Winner of the It’s Almost Christmas Giveaway! We are pleased to announce the winner of the It’s almost Christmas Giveaway contest. A warm Thank you to everyone who participated. There were so many great choices picked for people’s favorite products and it was really hard to choose a winner. 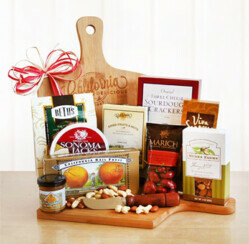 The winner we chose was Elizabeth Reese Hostetler and she won this Gourmet Cutting Board Gift Set by CaliforniaDelicious.com. This very special California Delicious wood cutting board gift comes with creamy Sonoma Jacks cheese, Three Cheese sourdough crackers, Nunes Farms roasted fancy nuts, Napa Valley hot and sweet mustard, chocolate chip cookies, California dried fruits and nuts, Marich chocolate covered cherries, Viva Sonoma biscotti and California Rail fruit candies. All this plus a wood handle cheese knife make your California picnic complete. Help us congratulate her and stay tuned for our next giveaway!